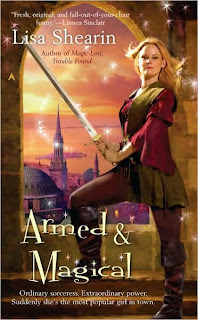 Armed & Magical begins immediately after the first book ends. Raine and Co. are on the Island of Mid, restlessly holed up in the finest suite the Conclave and its Guardians have to offer. The paladin has assured Raine that someone within the magical university hierarchy will be able to help rid her of her increasingly uncomfortable link to the Saghred--the ancient, malevolent stone intent on sucking her soul dry. Unfortunately, a notorious elven assassin seems to be targeting the paladin and the archmagus--Raine's two lone friends in this new, hostile environment. After singlehandedly foiling this attempt, Raine joins the hunt to unearth who is paying the assassin and why he seems to be amassing a group of hostage spellsingers. Never more than a step away from death, Raine finds herself embroiled in goblin/elf warfare as well as some nasty political power wrangling at the university. When Tam appears unexpectedly in the middle of a particularly harrowing encounter in a dark alley, their already hazy relationship quickly shifts to an even murkier shade of gray, and Raine struggles to figure out just which shady character is behind which threat and whether or not any of them can be trusted. I couldn't keep a little smile off my face. "Most girls get flowers or candy. I get a declaration of martial law." Well, I can't keep a smile off my face when I read a Lisa Shearin book. So it's a match made in heaven. Thank you for your kind words and wonderful review! OK, I just got a copy of this book as a present, but I don't have book 1! I'm going to have to buy Magic Lost, Trouble Found, I'm DYING to read this series!! Everyone has good comments about it, so I'm pretty sure I'm going to love reading it. Lisa, that's music to my ears. even more intense than the alley scene? Sign me up. Janicu, I hope you can get your hands on MLTF soon cuz I think you will really enjoy this series. I have never heard about this book before it's going straight on my tbr list, it sounds soo good!!!! Hi, Robin! I'm glad I sold it well. ;) When you do snag a copy, let me know what you think of it. So far the series is building really well. I have a feeling the third one will be excellent. After reading your review of MLTF, it was a given I'd end up reading it. Turned out that was sooner rather then later, and I'm hooked! Just finished the first, and thanking the heavens I've got the second ready to go! I'm surprisingly undecided on my team, though. Hmmm...We'll have to see if that changes with Armed & Magical. And, at this point, I'd like to just give you my eternal thanks 'cause I've no doubt you're going to point me to many more wonderful books in the future.